Attracting birds and other wildlife to your yard can be fun, especially over the winter months when it can get pretty dark and grim out there, but birds just seem to brighten the day and any yard when you attract them with bird feeders and homes. Below are some of my favourite ones. If you offer birds a place to eat and get water (don't forget to offer them water even in the winter with some heated bird baths) then will likely look nearby for a place to live and raise their wee ones. But birdhouses don't have to be plain. If you love to express your personality in your yard with your gardens, then extend this to your choice of unique birdhouses and feeders for fun! Check out these below to give you some ideas! Click on any picture to see it and many more. This has a very whimsical look and can add some pizzazz to your yard. It is cute but also functional, can be hung up and has lots of drainage. If you love camping and trailers, or just want something a little different to brighten your yard, try one of these cute birdhouses that comes with a rope to quickly hang. Even if the birds don't use it right away it is definitely cute! If you love rustic, or country styling, you can extend this to a cute birdhouse that not only serves as a home and shelter for your backyard birds, but fun to look at too! This bird house was created from recycled barn wood and has 3 spots for houses. 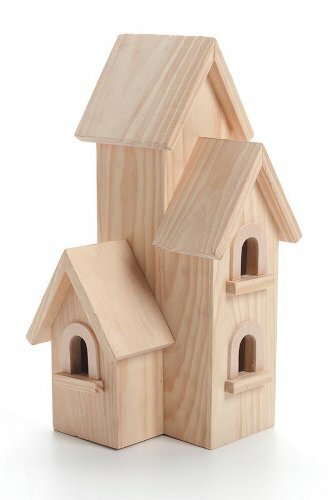 The perfect condo for your backyard feathered friends! This works for anyone who loves the rustic look. I love this one! Very rustic looking yet durable and will be a great home for a lucky bird! You can hang this anywhere and it will add some decor to your yard especially in the winter months. 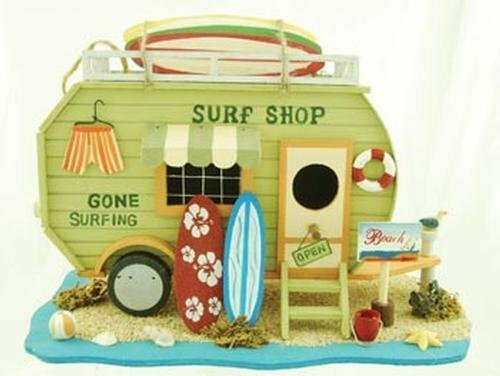 This one has cute window boxes and everything! Super cute addition to your yard. I love anything that has a dual purpose. This one is as cute as a button! You can see how unique birdhouses can add some whimsy and decor to your yard. Birdhouses and bird feeders do not have to be plain. You can get lots of kits online to build your own or check out the ones above online all ready to go. Unique Birdhouses are like Functional Pieces of Art! These make great gifts for the bird lovers on your list anytime of the year. You can hang them from tree branches or tall garden hooks to give your birds some safety, or attach to fence posts. If you love decor and whimsy in your yard then consider these functional pieces of art. Not only are you helping your fine feathered friends find shelter, you bring your yard to life even during those long winter months. Create some feeders and make your own homemade bird food to add, and also don't forget about the squirrels. Don't spend all your energy on chasing them away, simply give them their own squirrel feeder in another corner of the yard and they will also bring you joy and entertainment throughout the year. Make your yard as relaxing as possible and add the accents that make you feel good. Enjoy!